I just finished reading “I am Haunted: Living Life Through the Dead” by Zak Bagans, producer and lead investigator for the television series Ghost Adventures on the Travel Channel. I have to say that this was by far the strangest experience I have ever had reading a book. I have been a fan of Ghost Adventures for years. When I was teaching photography to high school students, every October I would teach the students how to create their own ghostly images through long exposure and the use of tripods. I would show clips from the television series to engage the students and aid with their storytelling process (we would pretend we were investigating hauntings at the high school). My former students still mention this show and the ghost photos assignment as a fond memory from their high school experience. So when I saw that Zak Bagans had penned an autobiography I knew I had to read it (though now I know this is actually his second book). I guess I should also mention that I am an empathic intuitive medium. I have been seeing and talking to spirits since I was a kid. In recent years, I have been working on honing my skills to help myself and my loved ones (I don’t do readings for profit). In recent weeks, with the passing of my grandmother, my abilities have become stronger. 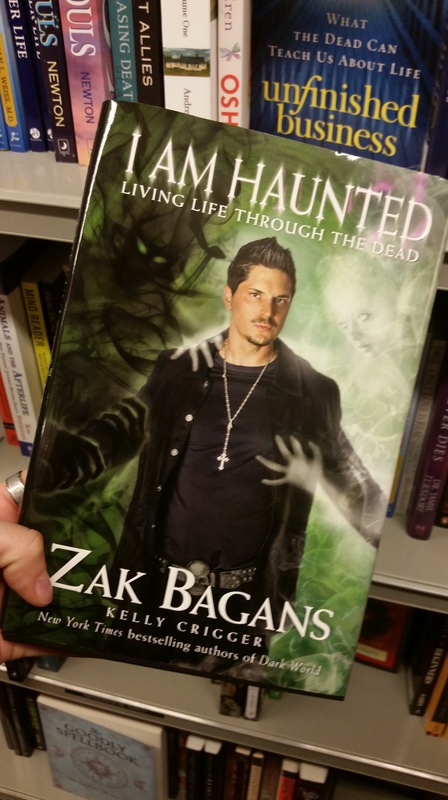 Reading Zak’s book made me wonder if my sight was beginning to change once again or if my mind was playing tricks on me (extremely vivid imagination, perhaps). I started reading the book late in the evening before bed (perhaps a mistake on my part). I could actually hear Zak’s voice in my head as if he were reading it to me. I could also relate to some of his stories in regards to his own sensitivities. (I didn’t know that he once lived in my hometown of Detroit). I was excited, thinking this was going to be a fun read since I was already connecting to the stories. I have always been the type of reader who gets immersed in a book but rarely does that happen when I am reading an autobiography. With this book, the visuals really started to take over and I found myself in the locations as if I was alongside Zak, Aaron, Jay and Billy. I could see the location, smell the dankness at times, hear the sounds and feel the spirits–4D reading, in a sense. As I was pulled deeper into the stories and the locations, I could hear my own guides warning me about protection and dark entities. It would get so intense that I would have to stop reading and light some palo santo in my room for cleansing. This has never happened to me before. This was all occurring the first night. I did my best to shake off the feelings so I could go to sleep. At 3:05 am, I woke to shadow figures in my room telling me they were there because of my connection to Zak Bagans. I don’t have a connection to Zak. I watch his show and I am reading his book, that is it. They kept trying to tell me it was more and that I needed to get him to come back to Los Angeles. I needed to take him to Devil’s Gate Dam. I kept telling them no, to leave me alone. I started praying, chanting, calling in good spirits to make the shadows go away. I used my shamanic techniques to make them leave and they warned they would be back. Then the good spirits told me I had to warn Zak about protection, teach him what he needed to do and don’t let him go to Devil’s Gate. Then they sprayed Florida water on me and that is when I woke up, for real. It was all a dream, at least I hoped it was all a dream–a weird, vivid dream. The next day, my clairvoyance/mediumship teacher posted a video in regards to psychic protection–just a weird coincidence. I continued to read the book. I reached a section where Zak discussed going to a salt mine for a breathing treatment. I was actually in the Salt Studio in Pasadena for a therapy session in the salt room to treat my own allergies and asthma when I read this particular passage–another weird coincidence. I continued on with the book but took a break after reading about the exorcist house in St. Louis. I was playing around on social media and Instagram when I noticed a childhood friend of mine posted an image of Linda Blair from the film The Exorcist. Again, just another weird coincidence. But I pushed through and finished the book. It was an interesting book, as a fan of the show, but a hard read when I felt like I was spiritually put into all of these places along with the GAC. I had to consistently cleanse my room and wear protective jewelry. I slept with Holy Water near my bed. It was just a really strange experience–a book has not affected me like this since I tried to read “The Exorcist” in the sixth grade (I never finished the book because of all the nightmares it gave me and I wound up throwing it away at school). The day after finishing “I am Haunted,” I decided to drop in on a mediumship class where my teacher spent the first half of the class going over psychic protection–a final weird coincidence.